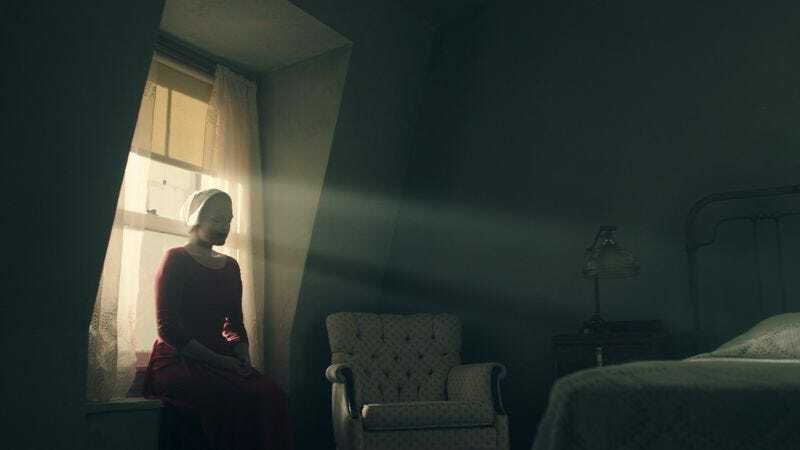 Now that Mike Pence is a heartbeat (or mean tweet) away from the presidency and the state of Texas has approved new rules requiring the burial of aborted fetal tissue, The Handmaid’s Tale is starting to look less like dystopian sci-fi and more like our dystopian future. Right on cue, Hulu is producing a 10-episode first season of an ongoing series based on Margaret Atwood’s novel, and today the streaming service released first-look photos from its adaptation. Elisabeth Moss stars as Offred, a “Handmaid,” or sexual surrogate, who serves in the household of one of the political elites known as a “Commander” in the misogynist, theocratic totalitarian state known as Gilead. Formerly part of the U.S., Gilead was formed around the time that a series of environmental disasters left most of the female population infertile. In the aftermath, the Gilead authorities coerced the remaining fertile women into chattel slavery, where, as “handmaids,” they would bear the children the Commanders’ wives could not—with all the disturbing accompanying connotations. Amid this nightmarish environment, Offred hatches a plan to find the daughter that was taken from her. Anyway, it’s a real gut buster, and in the first-look photos—which you can see below—we see Moss and her fellow Handmaidens gathering for prayer accompanied by armed guards, Joseph Fiennes as Commander Fred Waterford, and Moss contemplating her seemingly inescapable situation in bed at night. The Handmaid’s Tale debuts this coming April on Hulu.